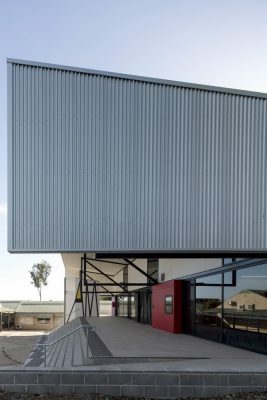 The aim of the project was to build a purpose designed seniors study centre for year 11 and 12. 2015 would be the first year the school would have a year 11, and 2016 a year 12. Expansion of the school provides additional educational facilities for the area. Ie. 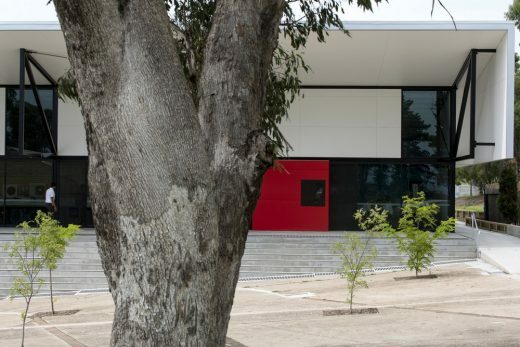 the school can now be classified as one providing education from Kindergarten to HSC (year 12) for those within the community. This provides security for parents of the community knowing that their children have the benefit of belonging to one school and one campus for all of the their secondary education, giving children the opportunity to grow friendships and for their parents to grow friendships with other parents. Parents of the school had the opportunity to come to a presentation and question and answer forum regarding the school’s planned new seniors study centre. In addition local newspapers ran articles about the project with pictures of perspectives of the proposal. The building contains operable glass at various heights and directions to maximize cross ventilation, low e glass is used, water saving taps and toilets, compact fluorescents and led lighting. How is the project unique? ‘In public buildings the rooms are by nature expansive and to some extent inter-related, thus permitting all manner of spatial patterning and invasions of privacy by one room on its neighbouring areas. Often these invasions are not merely permissible but positively advantageous.’ Robyn Boyd, Architect. This positively advantageous invasions of privacy was formulated as a strategy of Unstable and Stable spaces, the unstable being the focus with an overall theme of flexibility where boundaries between the unstable were flexible, transparent or invisible. Flexibility was of particular importance given the sheer number of subjects on offer at HSC level and the fact that in small schools this results in many small classes. In addition the advent of digital technoligies has broken down the boundaries of the traditional 4 walls classroom. Therefore the rooms of the senior study centre needed to be able to be divided easily with curtains or operable walls. 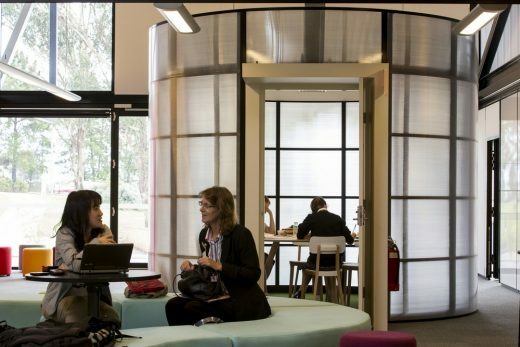 In addition small meeting areas which can double as classrooms, and in built furniture in the form of niches that act as small private study groups. 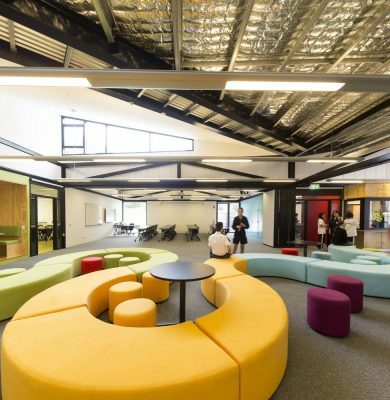 A central learning space is introduced flanked by classrooms. 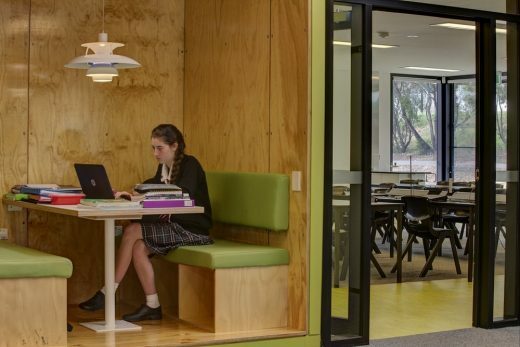 This central learning space is designed in the manner of an open reading area in a library. It is a communal space for students. This is well suited to the system that contains free periods for study. 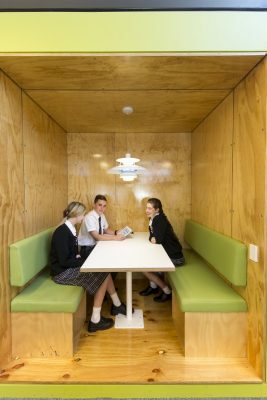 The central learning space provides students with wi-fi, seating, niches with in built seating, a kitchenette and a circular meeting room. 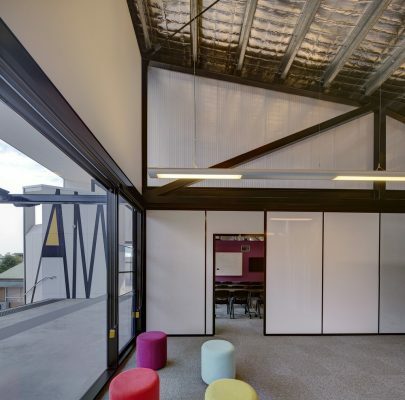 This room is flanked by operable doors that allow for classrooms to open up into this space to create one large open area. 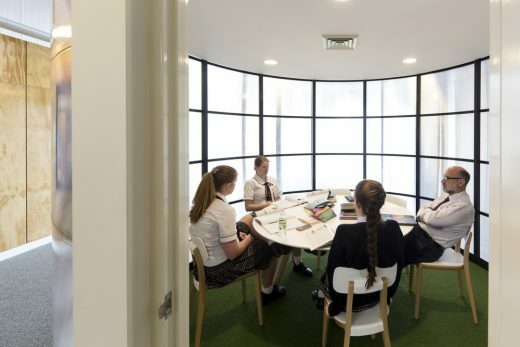 This area can be used for school functions, school assembly and is designed to be large enough and within the guidelines of an examination room for HSC exams. What building methods were used? 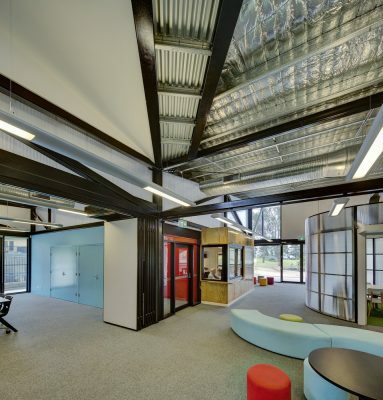 The structure, a series of 40m long steel trusses are supported on a 8 x 10m grid, this allows all walls internal and external to be non load bearing and removable, thus ensuring maximum flexibility into the future. 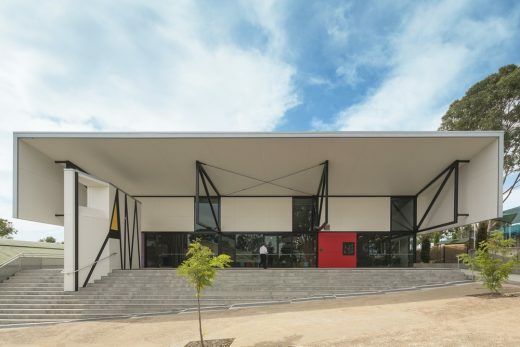 Materials were chosen based on their textural appeal, their low impact on the environment, their ability to age gracefully, thermal performance, and durability and that they were different to the existing brick building of the rest of the school. 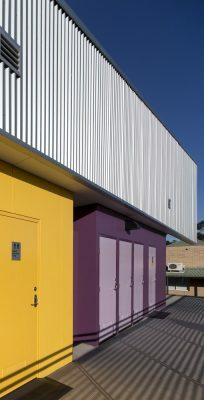 A high degree of contrast in colour and texture were considered essential in establishing a fun vibrant happy learning environment. Refer to the photos for evidence. This project presented the school an opportunity to provide a new identity for the school as a whole. 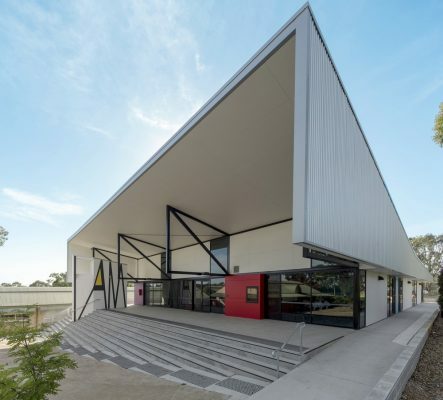 A bold, adventurous, dynamic and very flexible building to highlight not only a growing school but also one that is attuned to new digital technologies that effect the way learning occurs. Located at the entry to the school, the building is presented immediately. It is placed at 90 degrees to the existing administration building to form an outdoor courtyard. 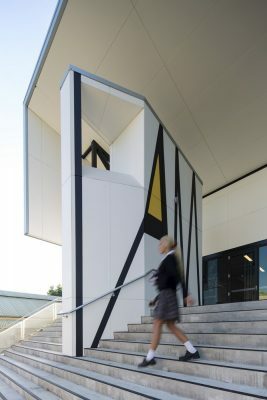 A large covered verandah and steps provide a new entry and identity, an inviting public address. 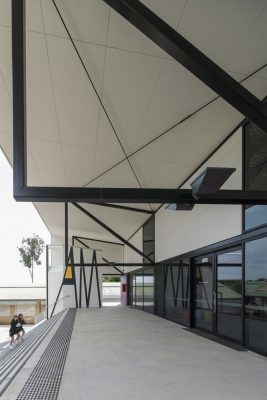 This verandah / portico becomes a meeting place for the school.